Successful beverage packaging involves both art and science. We sat down with Tom Jahnke, President at Advertising Art Studios, Inc., a packaging design and production company with more than 85 years of experience creating art for consumer goods industries. From getting the most out of the creative process to ensuring consistency in production, Tom shares what it takes to make sure your beverage cans stand out and consistently represent your brand. What is the typical beverage art creation process? There isn’t really a typical journey. It depends on where you are in your development and where you need assistance. It’s a collaborative process. Some people come to us with just a name and say, “I have this registered. I’m thinking it should look like this...and I want some fruit on it.” I usually ask them to go on the internet and find some examples that they like and also to show us what they don’t like so that we can narrow down the playing field and create some designs that hone in on what they’re thinking. We’ll do several sketches of their product to see what concepts they like. We’ll continue to refine the design until they're happy with a final version. Once we get to that point, it's a matter of putting together the production art that can go to the label company or the can company to actually produce the packaging. On the other hand, some people come with a rough sketch that we can clean up and enhance. Sometimes, people provide us with artwork that is essentially complete, and we have to put it on the die, add all the legal copy, and in the case of cans, we have to separate it. Sometimes we enter into the creative process, and sometimes we enter further down the line to help prepare for production. The creative side uses one side of the brain, and the production side is a little more technical and detail-oriented. It helps to have a team that brings different types of expertise together to cover all of those aspects. What makes printing on cans different than other types of printing? Most people are familiar with the standard 4-color process printing. In 4-color process, four colors (cyan, magenta, yellow, and black) are applied as separate layers to a substrate, and other colors are created by overlapping those colors or adding a spot color, or PMS color. Printing on a can is different because the can is already pre-formed into a cylinder. All of the colors must be transferred to the can at one time from one common plate. This means that the colors have to be trapped - adding a three to five-thousandth of an inch separation between colors - so they don’t bleed together. Because colors can’t be combined in the can printing process, you’re limited to six spot colors. To get some variation in tones, we can use dots of the spot colors and adjust how concentrated or spread apart those dots are. That’s what we do to create things like shading in fruit. We create a halftone dot to make it look round and more natural. One mistake people make when working with a designer that doesn’t have experience designing for cans, is falling in love with artwork that isn’t set up with the six-spot color limitation in mind. What is trapping and why is it so important? Because all of the colors are rolled onto the can at one time and aren’t absorbed into the aluminum, the colors need to be separated (or trapped) by a very small margin (usually three- to five-thousandths of an inch). When the can is printed and the colors spread out towards each other, they close the space that was created by trapping the artwork. The goal is to not see that space at all in the final printed version on the can. Do you have any design recommendations from your years in the beverage industry? It depends on your product. I don’t think it’s good to limit the creativity of the designer. If it's a healthy product, or if you think the strong part of the product is the fruit, then obviously you want to show fruit. If the whole purpose of the beverage is hydration, then maybe you show water on it. Perhaps you just want a really clean look. It ultimately depends on what you want and how you want to stand out in the market. How can you tell good can artwork from bad can artwork? You want to make sure the color is uniform across the can. Examine the text on the can. If you look at the type on th e back, you should see a little bit of silver on both sides of each letter. That tells you that the can is in registration. If there is a lot of silver on one side and only a little on the other side, that tells you that the can wasn’t printed in registration. The operator has a tremendous influence on how the end color looks. If the operator puts more pressure on during printing, he can achieve one shade darker and if he takes the pressure off, he can make it very light. You want to make sure that the printing process doesn’t change the artwork. Most can manufacturers will have a proofing process where they will print your design using a regular press, but at a very slow speed. This allows you and the can manufacturer to check the printing quality and adjust colors within reason. Printing variation can be caused by the type of aluminum – i.e. printing on a recycled can vs. raw aluminum. The time of year can also affect how the ink lays down. If you print in January when there is no humidity vs. August when the humidity is high, you’re going to see slightly different outputs. There is always going to be some variation in can printing, but it’s important to control what you can to achieve consistency across multiple can productions. What should you look for in a beverage art production company? Most importantly, you want to see examples of their work. Ask the companies that will be printing your designs, who they see the best work from. Ask the printers if they’re happy with the art and separations they receive from the company you’re thinking of working with. There are some advantages to going with a company that does both the designs and trapping in-house. If the designer who creates the artwork is involved in the process of trapping it, they can ensure that the design is maintained all the way through the process from beginning to end. 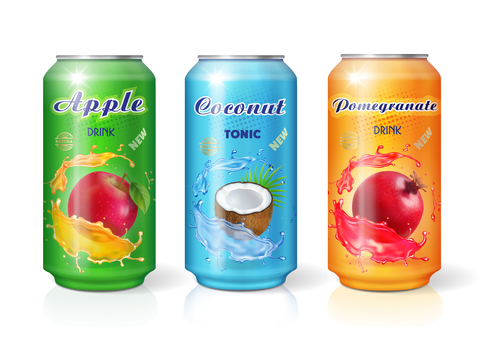 Your beverage’s can is your customer’s first experience with your product and your brand. Creating successful can artwork requires a unique and specialized set of skills. It’s important to assemble an experienced team with the right background and experience to guide you through the process and help you avoid some of the common mistakes that can cost you time and money. About Advertising Art Studios, Inc.
Advertising Art Studios, Inc. brings together the creativity and technical expertise to create finished art that is print-ready for all types of production processes. With more than 85 years of experience helping consumer goods companies achieve measurable marketing success, Advertising Art Studios comes highly recommended by the most respected producers of packaging in North America.